This past weekend at C2E2 was a great time! The Nerd City booth was the place to be, where we hung out with our extended crew, including The Godbeast and his family. We also spent a lot of time hanging out with the gang from The Pop Culture Network, who were kind enough to do not one, but two video segments on Galaxxor. The first of which is the one above, that hopefully gives you a little bit better sense of the various surfaces and optical effects that I have employed on the various figures up to this point. The second video is Pixel Dan's interview with yours truly. Be warned- I am EXTREMELY hungover in this video. So, if you have a thing for baggy undereyes, this may drive you insane with passion. All of the Galaxxor 004 figures literally sold out in a matter of minutes. I still do, however, have a couple of 002 and 003's left. They are now back up and available in the online store. Again, thanks to everyone who made C2E2 such an awesome event, and thanks to the PCN crew for the great coverage! Just wait and see what we have planned for next year! EDIT- Here's one more vid with The Godbeast and sons! I think I finally was able to capture a bit of the 004's rainbow holographic effect in a pic! Well, as you probably already know, The Galaxxor 004 will be exclusively available from the Nerd City booth #1026 at C2E2, March 18-20th. I will certainly be at the booth, as well as The Godbeast, and we'll be more than happy to talk Galaxxor with anyone who would care to. What you might not have known is that, since it's looking like the 004's are going to vanish in the blink of an eye, I'll be bringing the remaining couple of 002's and 003's so that everyone can hopefully get their Galaxxor fix. 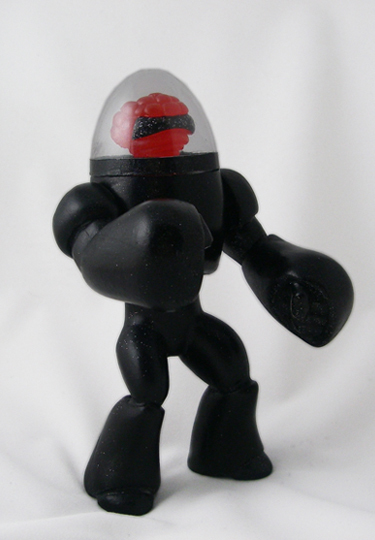 Even if you're not in the market to pick up one of these guys, be sure to pop by the Nerd City booth and say "hi". 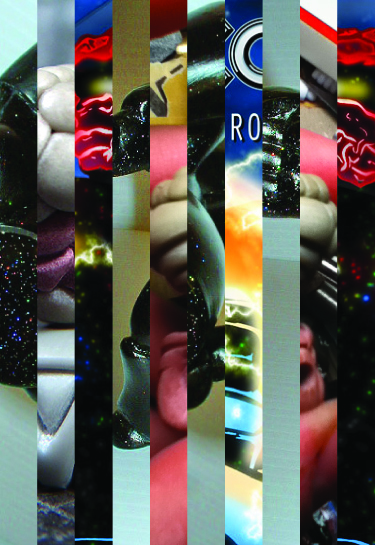 I plan to have on display every edition of Galaxxor thus far, as well as a couple of very interesting surprises! 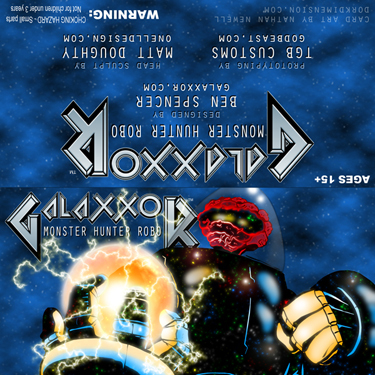 From the combined creative efforts of Ben Spencer, Marty "The Godbeast" Hansen and Onell Design's Matt Doughty comes the newest Galaxxor: Monster Hunter Robo, Galaxxor 004! 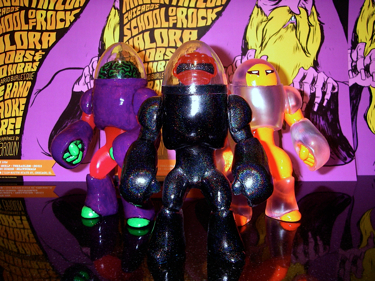 This classic 5.5" action figure-style resin art toy was sculpted by Ben Spencer, hand cast in black and translucent resin by The Godbeast and given a holographic rainbow glitter finish by Ben Spencer. 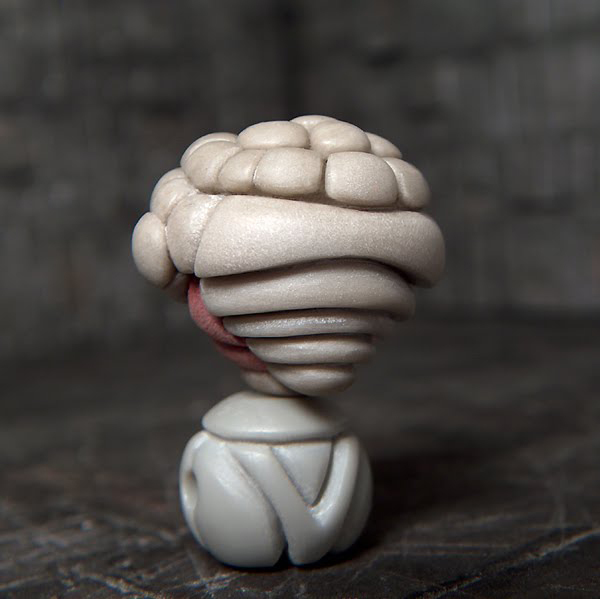 It also features a brand new head sculpted by Onell's Matt Doughty. 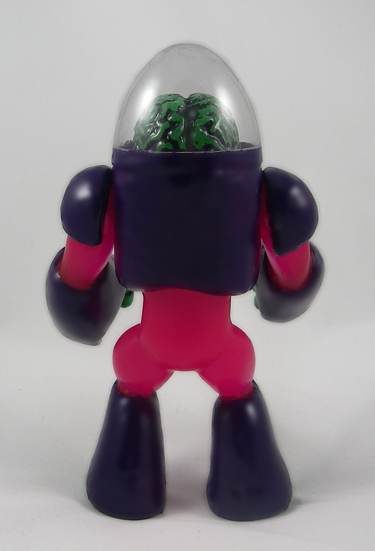 Galaxxor 004 features 2 points of articulation and comes packed in a traditional bag and header style with amazing exclusive header card art by Nate Newell. 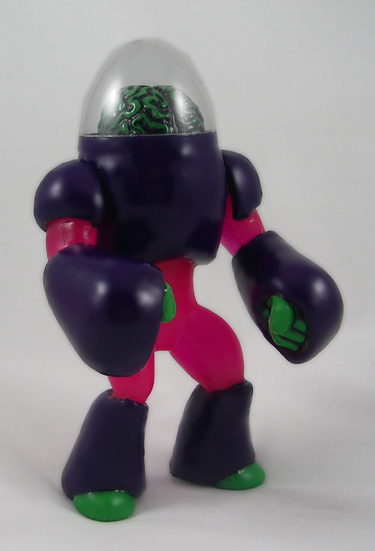 This figure is limited to an edition of 5 and will never be produced in this colorway ever again. 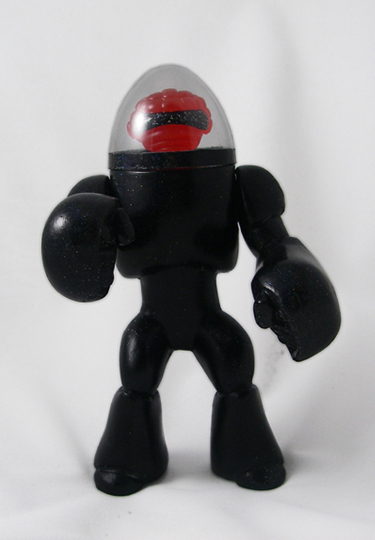 Galaxxor 004 will be available for $90 each, exclusively at Nerd City's booth 1026 at C2E2, March 18-20th. Straight from The Godbeast, himself, comes this WIP image of the Galaxxor 004. They are now headed my way for some painting/fine tuning. This should give a pretty good sense of the colorway, however, the holographic glitter that you see on the black body will be significantly enhanced by the painting process. Be sure to check out this entry on The Godbeast's blog for a couple more pics and even more details on all of the awesome stuff that he will be bringing to Nerd City's booth 1026 for C2E2. These are images of the front and back of the original sculpt, courtesy of Onell Design's Matt Doughty, for the head of Galaxxor 004. 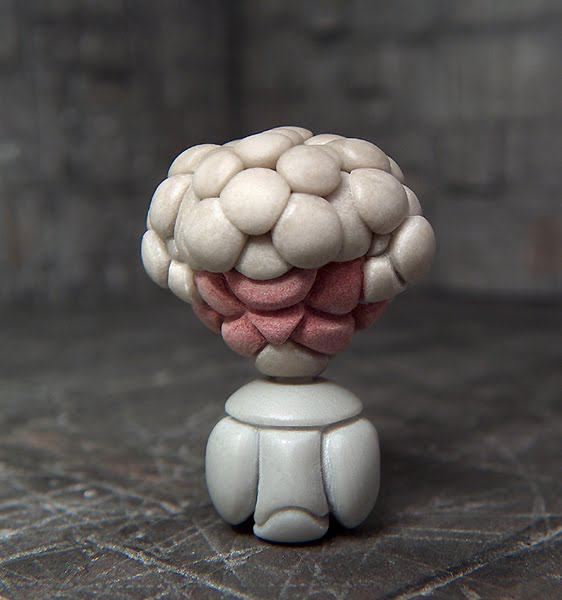 What's really amazing about this piece is that it can essentially function in either direction, as either a visored head or a mutated cyclops brain head. Pure evil genius. It's looking like the head for the 004 edition will come packed with the visor facing forward. However, if there is enough demand (and there certainly seems to be! 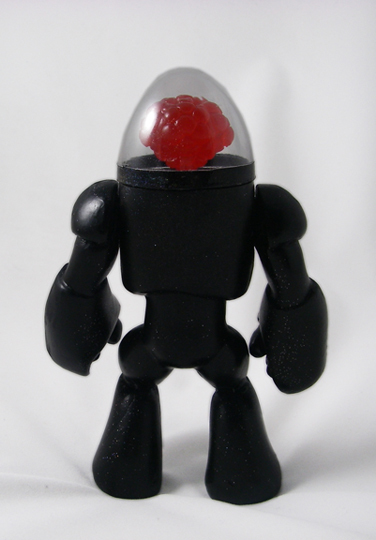 ), the 005 might feature this head as well, or maybe even the other head that Matt sculpted for this project! You can get all of the details of the sculpting process from this entry at the Glyos Transmission Web Log. 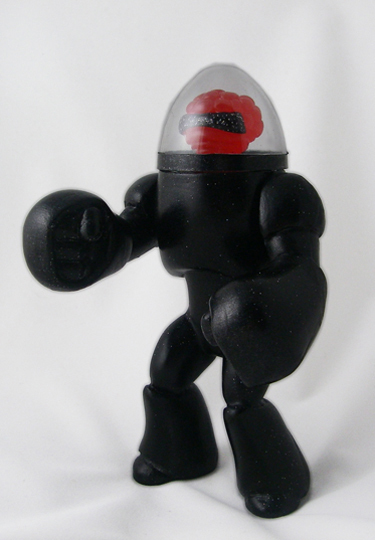 The Galaxxor 004 figure is going to be limited to an edition of 5, will cost $90 and will exclusively be available at Nerd City's booth 1026 at C2E2. These scrambled transmissions hint at the awesomeness that is going to be Galaxxor 004! 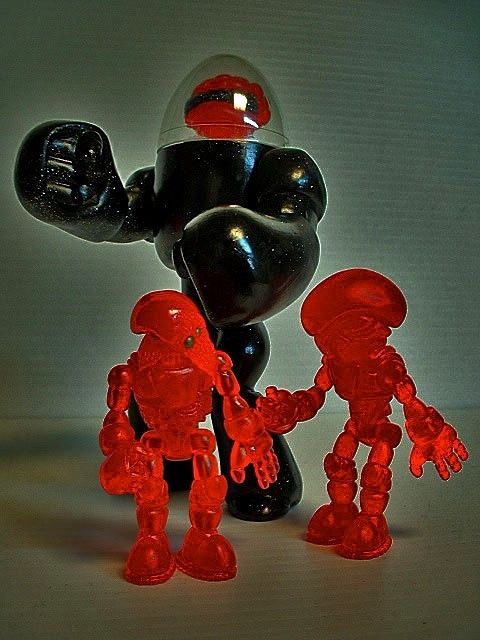 The fourth figure in the Galaxxor line will be a collaboration with none other than Matt Doughty of Onell Design. Matt has provided an amazing new head sculpt and the body will be the traditional Galaxxor shape. Additionally, header card duties will be handled by the brilliant Nate Newell of Dork Dimension. The mold making and casting will be courtesy of The Godbeast. These will be limited to an edition of 5 and sold exclusively at Nerd City's booth 1026 at C2E2. UPDATE- Matt has posted some insights, as well as sweet pics of his amazing head sculpts over at the Glyos Transmission Web Log. Check them out here. From the hive world X-544 comes the twisted third Galaxxor: Monster Hunter Robo, Galaxxor 003! This classic 5.5" action figure-style resin art toy was sculpted by Ben Spencer, hand cast in black light reactive magenta resin by The Godbeast and hand painted by Ben Spencer. 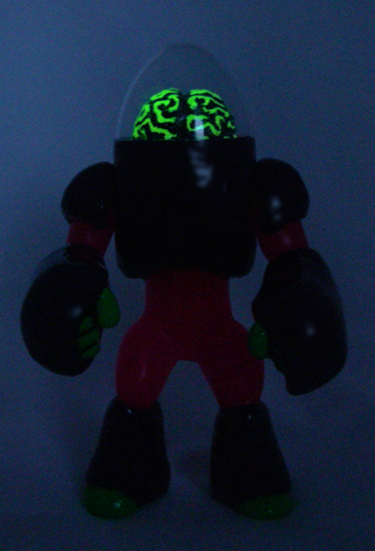 It also features a neon green glow-in-the dark brain! 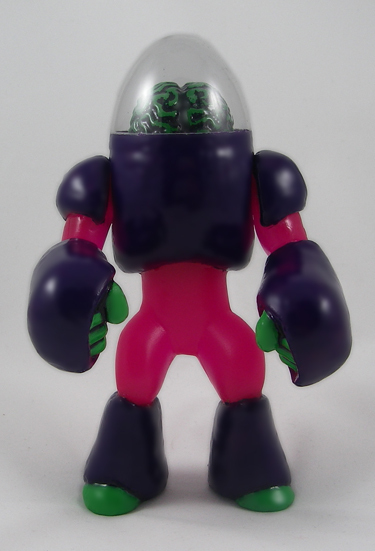 Galaxxor 003 features 2 points of articulation and comes packed in a traditional bag and header style with exclusive header card art by Steve Seeley. 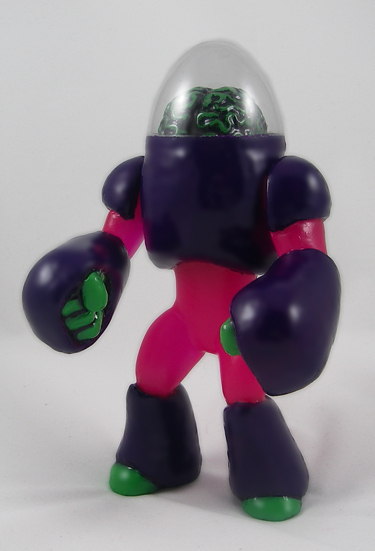 This figure is limited to an edition of 5 and will never be produced in this colorway ever again. 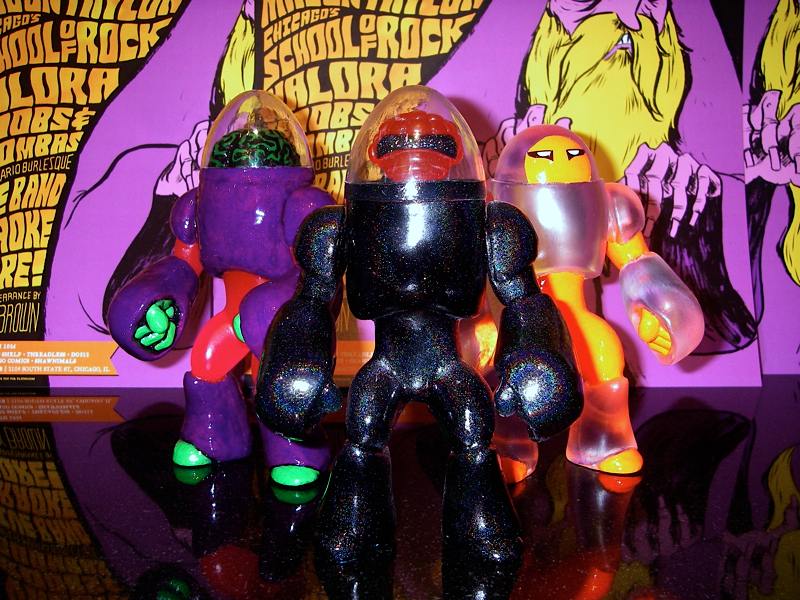 Galaxxor 003 will be available for $90 each on 03.04.11 at noon CST, exclusively from The Galaxxor Online Store.